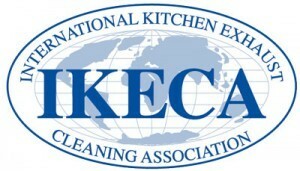 IKECA membership is the number one criteria to look for in your commercial kitchen exhaust cleaner. Are you looking for a contractor you can trust to clean your commercial kitchen exhaust system? Make sure you choose an IKECA member. Companies who have earned membership in the International Kitchen Exhaust Cleaning Association do better work and provide better peace of mind. Here are the top 5 benefits of hiring a certified company like Flue Steam. The number one reason to always use an IKECA-certified contractor for your commercial kitchen exhaust system cleaning is that our employees are fully trained in proper cleaning techniques and held to a high standard in their work. Being able to trust your kitchen exhaust cleaning contractor to do excellent work is extremely important, because it can be difficult for you to visually confirm that the work has been done properly. Some uncertified companies take advantage of this and only clean the easy-to-see areas, but Flue Steam really will clean every inch of your exhaust system to the bare metal every time. Unlike many trade skills organizations, IKECA does not award certifications for life. Instead, member companies and their workers must continue their education to maintain their certification. This means that if a company has an IKECA certification, you know that they are completely up to date on the latest best practices for proper exhaust system cleaning and will be implementing those techniques in your kitchen, not plugging along with some decades-old strategy. Some companies may advise all their clients to get monthly service, regardless of whether their grease accumulation actually merits this. At Flue Steam, we have learned how to use the IKECA comb to measure grease deposits in your ducts, determine the rate of accumulation, and set a cleaning schedule accordingly. This schedule will ensure you get cleanings before grease deposits reach critical levels but also save you from the cost of unnecessary cleanings. Your average exhaust cleaning contractor is satisfied to just do the best job they can based on the architecture of your ducts. This may leave some areas improperly cleaned. As an IKECA-certified contractor, we understand the requirements for access panels and how this affects cleaning. If your system is missing access panels, we can install new code-compliant ones at the proper intervals for you. One final reason to always choose a certified kitchen exhaust cleaning company is that our work will always satisfy your local fire code inspectors, saving you from costly code violations and restaurant closures.